A clafoutis (pronounced "kla-foo-TEE") is a rustic French dessert made by baking cherries in a custard-like batter similar to the one used for pancakes. Traditionally, a clafoutis is specifically made with black cherries, although many variations include other fruits such as plums, prunes, blueberries, or apples, though technically, these variations should be called flaungardes, not clafoutis. Some bakers like to leave the cherry pits in the cherries when making clafoutis, but baking the clafoutis with unpitted cherries produces a much stronger cherry flavor and it also prevents the cherry juice from leaking out and coloring the batter. If you make one with pits still inside, be sure to let everyone know. Beat the eggs, then add the sugar, salt, milk, and vanilla extract and stir until well blended. Gently stir in the flour and mix gently until just combined. Don't use a blender or food processor as this will overwork the batter. Pour about one-third of the batter into a buttered 2-quart baking dish and transfer it to the oven for 10 minutes. This quick pre-baking stage helps set the bottom part of the batter so that the cherries don't simply sink to the bottom. Remove the dish, but leave the oven on. Next, scatter the whole cherries over the top of the set batter, then cover the cherries with another 1/3 cup of sugar, distributed evenly. Finally, pour the rest of the uncooked batter over the top. Return it to the oven and cook for another 45 to 60 minutes without opening the oven door, or until it's puffed slightly, set, and golden brown around the edges. It may jiggle slightly in the center; this is fine as the middle will set as the clafoutis cools. Let it cool for 10 minutes, then sprinkle with powdered sugar and creme fraiche (or whipped cream) and serve while still warm. Note that the only thing giving the clafouti its puffiness is the steam from the batter. There is no added leavening agent (such as baking powder or baking soda). This is why it's fairly critical to avoid opening the oven door during cooking, because doing so can cause the clafouti to collapse. 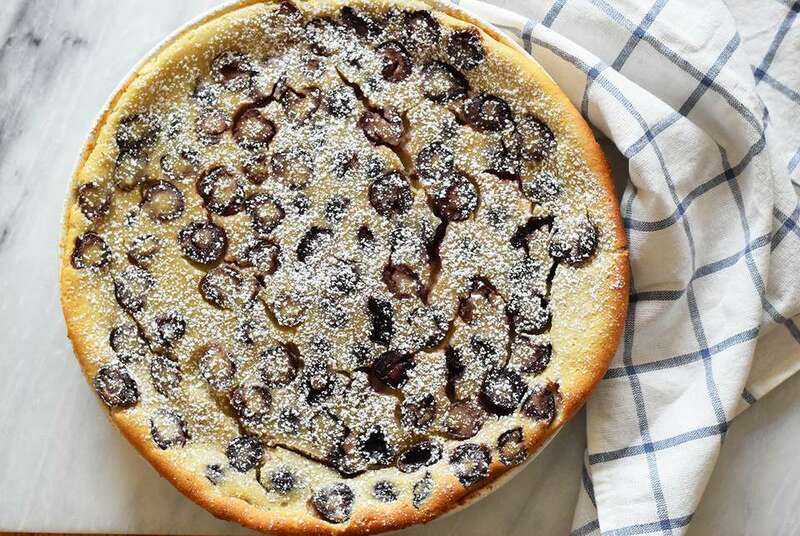 Finally, most people today will use ordinary sweet cherries for making cherry clafouti, although traditionally the variety that was used was the black cherry. Black cherries impart a sharper flavor with slightly more bitterness, so if you do use them, you may find that you have to increase the amount of sugar somewhat.